I am a mom of an autistic child who has a history of eloping. It was one of the scariest things that I’ve ever gone through and I wouldn’t wish that kind of fear on anyone. That’s why I created these free DIY printable autism ID cards. It’s one of those things that I wish I’d had when my daughter was younger. It’s one of those things that I (almost) wish I didn’t have to make. They are a long time coming and go along nicely with a few of my other free printables for autistic children and their caregivers. I’ve spoken, in the past, about my daughter’s history of wandering or eloping. It is an incredibly nerve-wrecking situation but I’m fortunate that each time she returned home safely. Far too often, we read stories in the news about autistic children who have wandered and never returned. Or, we read stories in the news about confrontations between autistic children and law enforcement or medical personnel where there is little to none in terms of training. There is such a language barrier and I am not faulting our law enforcement or medical personnel at all. It’s often a matter of knowing what to say and how to say it. But, for our autistic children who may not understand? That’s asking for quite a bit. As parents, we can take some measures of precaution and (hopefully) prepare ourselves as best we can. But how? 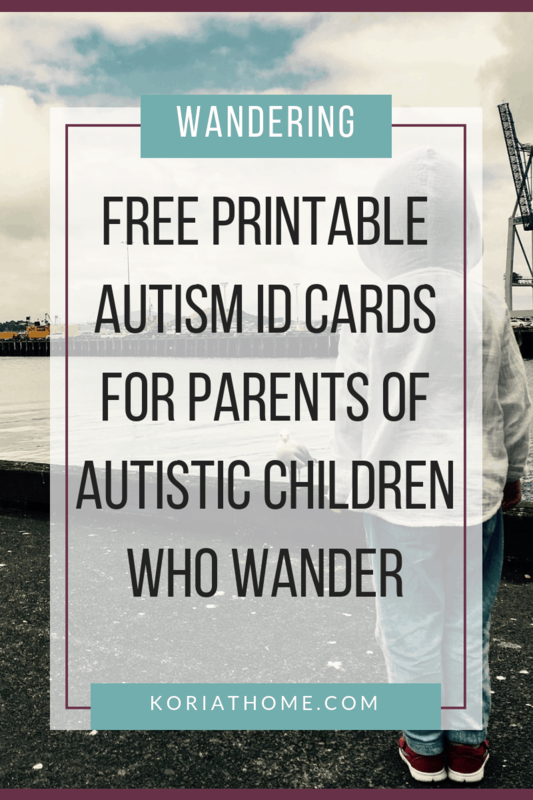 These free printable autism ID cards can be carried with you wherever you go. You can put them in your wallet, purse, glovebox of your car — anywhere really. Whether you are using these for an emergency situation, to help your child better communicate; or in the event of an emergency– these cards are perfect. While they are not sized for a wallet, if you laminate them, you can put a copy in your child’s backpack. Other situations that you can use them, are with a family emergency pack that you keep in your car. 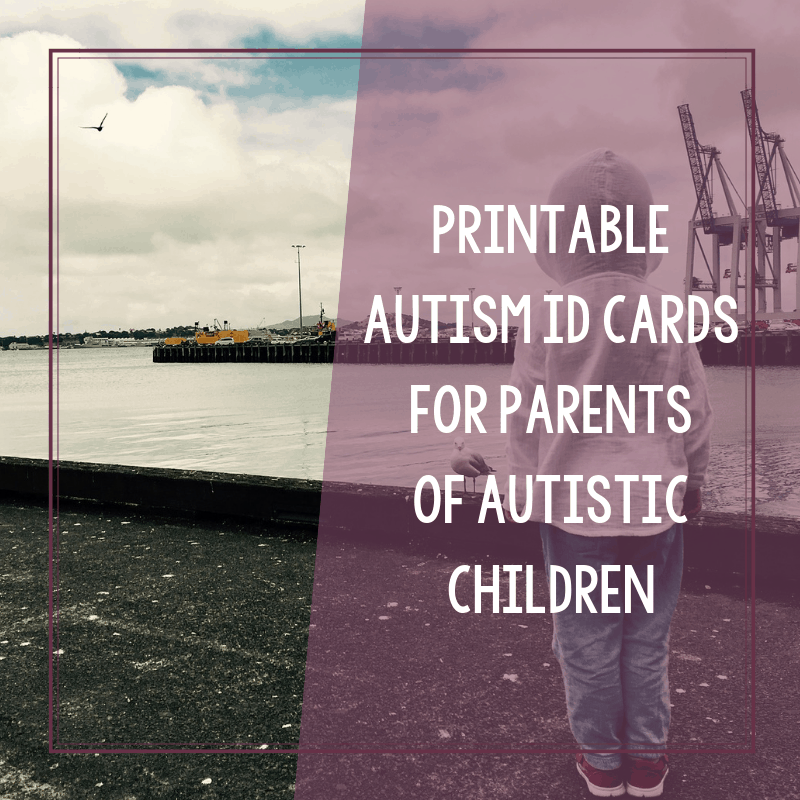 In the event that something happens to you and you are unable to communicate about your child; these printable autism ID cards will definitely come in handy. In my subscriber hub, you’ll find two copies in addition to all of my free printable resources. And you’ll also find editable versions of both. I’ll have a help video in there as well to show how to edit them before printing them out. 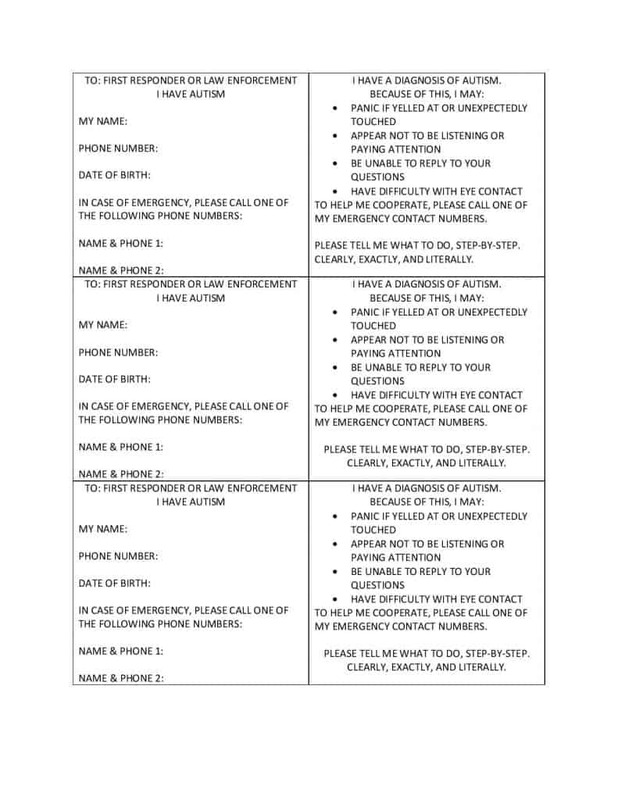 You can put your child’s information on the one side while the reverse side includes some simple instructions for a first responder or law enforcement official. With parent’s permission, classroom teachers or aides, could also fill out these printable autism ID cards for their classroom.